The TGV network in Belgium is seen as an integral part of the future European High Speed railway network, which is designed to provide a total of some 29000 kilometres of through routes suitable for operation at 250 km/h or more between major cities like Madrid and Stockholm, or London and Naples, by 2010. France has provided much of the impetus behind this plan, by demonstrating the potential for high-speed rail with its pioneer line between Paris and the Southeast France, opened in 1981. Since then, five other European countries have folowed this example more or less closely: Italy, with the Pendolino (a tilting TGV), Germany with already three generations of Inter-city Express (ICE); Spain, with the Alta Velocidad España (AVE); Sweden with the X2000 and now Belgium. Because of of its position as the 'crossroads of Europe', Belgium is at the heart of this ambitious project. This is evident from the way in which Brussels is already the main point for interchange between the Eurostar services to London and the Thalys services between Paris and Amsterdam or Cologne, as well as many others. Today, the high-speed train appears to be the saviour of the railways. For, since the 1960s, the SNCB (Belgian railways) has been abandoned by almost one in two passengers and its network has shrunk by about 30%. Yet, only the railways can provide the solution to the increasing problems of traffic jams in towns and congested highways between them. These problems have an economic impact as well as an ecological one, because they (delays, accidents, pollution etc.) indirectly increase the cost of transport by some 4.5% of the GNP, ten thousand billion BEF each year, 92% of which is attributable to road transport! the Western HSL, which is the part within Belgium, some 71 km long, of the route taken by TGVs between Brussels and Paris or London. It lies between the French border at Esplechin and Lembeek, where it makes an end-on junction with Line 96N for the 17 km onward to Brussels, which is being upgraded for operation of speeds at up to 220 km/h. This HSL, which was taken into service on 14 December 1997, cost some 50 billion BEF and is reserved exclusively for TGVs. the Eastern HSL, which is being built between Brussels and the German border, is intended for use by Thalys TGVs and certain other trains (possibly including ICEs working through from Germany). The new line will link upgraded sections of existing lines (notably the first 33 km of Line 36, between Brussels and Leuven, where four tracks (200 km/h) will be available throughout). Once it the new HSL alongside the E40 motorway between Leuven and Ans (61 km) has been completed at a cost of 40 billion BEF in 2002, TGVs will be able to run on it at up to 300 km/h. Some details of the work costing 25 billion BEF east of Liège remain under study, but TGVs will run through a long new tunnel before rejoining the existing line 37 for the last part of the climb up to the watershed at the border. The Northern HSL will significantly reduce the time taken by Thalys services between Brussels and Amsterdam. But a new alignment, mostly alongside the E19 motorway, has been adopted only for the 40 km between Northern Antwerp and the border with the Netherlands; construction, which is due to cost 10 billion BEF, began in 2000 and should take five years. Between Brussels and Antwerp, the four existing tracks of Line 25 are being upgraded over 47 km for operation at speeds of up to 160 km/h, at a cost of 23 billion BEF. Eurostar, which operates services via Lille and the Channel Tunnel between London and Brussels (or Paris). Ten journeys taking 2h 40m are scheduled daily, most of which call at Lille Europe and Ashford International in Kent. Network TGV, like those used within France but equipped for operation with 3kV DC power, which provides services between Brussels and various cities in France beyond Paris. Some eight such services run daily via Lille Europe to termini including Lyon, Grenoble, Nice, Marseilles and Bordeaux. Bruxelles-Midi, which is now being rebuilt for the fourth time. As Belgium's biggest and busiest station, with the widest range of interchange possibilities, the introduction of TGV services on the three routes mentioned above has provided the opportunity not only for renovation of the station itself, which should be completed in 2002, but also the redevelopment of much of the surrounding area. Liège-Guillemins, which is the only stopping-point in Belgium for TGVs running between Brussels and cities in Germany. Much of the existing station has already been demolished so that a new track layout giving better cross-platform interchange facilities can be installed slightly further south. This work, costing 3 billion BEF including the new station building designed by Santiago Calatrava, should be complete in 2002. Antwerp-Central, which will be the only stopping point in Belgium on TGV services between Brussels and cities in the Netherlands. Although the magnificent station building and overall glazed roof dating from 1905 are being retained, the track layout is being completely remodelled to provide an underground through route between Berchem and Antwerpen Dam for both TGVs and other trains. This work, during which part of the present terminal station approached on a long viaduct will remain operational, will include installation of new terminal tracks just below ground level and should be complete by 2005. Of course, these are not the only stations in Belgium to be served by TGVs; the other main cities will continue to have daily connections to Paris and perhaps in future also to other points on the European high-speed network. And the SNCB already envisages that it will be neccesary to build a second TGV station for Brussels near the point where the line from Amsterdam joins that from Cologne, in Schaerbeek, when the traffic has become too great to be handled at Brussels Midi/Zuid alone. By that time (about 2010), it may be expected that frequent direct Thalys services will be linking Paris CDG, Brussels National and Amsterdam (Schipol) airports in replacement for the present air services between them. In the case of Belgium's first high-speed line, once the civil engineering work (embankments, cuttings, bridges etc.) was complete, an average of 1530 metres of the 149 km of track between Lembeek and Esplechin was laid every day. This involved installing 700 thousand tons of ballast, 250 thousand monobloc concrete sleepers and 18 thousand tons of rails, using a special technique. Operation at 300 km/h requires track that complies with a particularly high standard of precision and stability. The two tracks of the high-speed line are laid 3 metres apart along a corridor with a surface 15 metres wide. The rails are delivered in sections with an average length of 288 metres which are welded together and attached to 1666 sleepers every kilometre. The sleepers are first laid on a layer of ballast 35 cm deep, and then more ballast is added until the sleepers are fully enclosed by it, so that only their tops remain visible. Of course, there are no level crossings as the line is completely enclosed by a wire fence. The maximum gradient is 1 in 100, and the minimum radius of curves is 6 km, which means that a right angle bend corresponds to a track length of some 9.42 km. Unlike most other lines in Belgium, which are electrified with the 3000 V DC system, the high-speed lines are electrified at 25 kV 50 Hz. A special signalling system is also used, not because at 300 km/h the driver would not have time to observe conventional track-side signals, but also because they could not provide all the information he needs. So high-speed lines are equipped with a cab-signalling system known as TVM or TBL, depending on the design. The principle of operation is that of dividing the track into a series of blocks (or sections) in each of which a speed limit is set separately. As only one train is allowed to occupy any block at a time, the corresponding speed limit can be transmitted to it through the rails by means of signals at certain frequencies. On board the train this speed-limit information in the received signals is decoded by a computer, and displayed in the cab beside the train's own speedometer, so that the driver can compare them whenever necessary. For more detailed information, see the pages on the construction of a high-speed line and on the signalling system for high speed lines. A total of 205 billion BEF is being invested in the Belgian TGV Project, of which 188 billion BEF is for the infrastucture and 17 billion for rolling stock. The TGV Finance Corporation will contribute the remainder, 120.5 billion BEF. The TGV Finance Corporation (FTGV) is a public company created specially in 1997 to provide the funds needed to finance the TGV project within Belgium. It is itself funded from various sources, including 32 billion BEF from the Federal Shareholding Company (largely the proceeds of the partial privatisation of the Belgacom company) and 10 billion BEF in the form of land and buildings from the SNCB, with the rest coming through loans, notably from the European Investment Bank. So far as the rolling stock is concerned, the FTGV will cover 4.5 billion BEF and the SNCB will provide the remainder. The FTGV is thus contributing a total of 125 billion BEF to the investments in the Belgian TGV project. These funds have been made available to the SNCB in stages, the last of which was the 15 billion BEF paid on 30 June 2000. December 1996 : A TGV ski-train starts running once weekly between Brussels and Bourg St-Maurice. 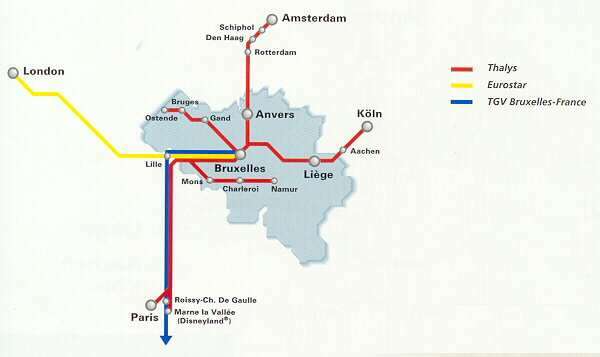 01 June 1997 : Network TGVs introduce new services to major cities in France (Aquitaine, Brittany, the Alps, the Côte d'Azur and Languedoc/Rousillon), and a direct Thalys service begins running between Brussels and Disneyland Paris, using the first 13 km of the high speed line to reach the conventional network near Antoing. 10 December 1997 : Inaugration of the remaining 60 of km high-speed line between Antoing and Lembeek, some 15 km southwest of Brussels. The scheduled journey time to Paris is now 1h25, to London 2h40. 14 December 1997 : Introduction of TGV services Namur - Charleroi - Mons - Paris and Ostend - Bruges - Ghent - Brussels - Paris. 14 December 1997 : Start of public operation of Thalys services via Brussels between Paris Nord and Amsterdam or Cologne, using Thalys PBKA TGVs. November 1999 : Start of operation of four daily Thalys TGVs between Brussels and Disneyland Paris via Paris CDG Airport. 28 May 2000 : Start of daily operation of a Thalys service between Brussels and Geneva, in Switzerland. 10 June 2001 : Thanks to the completion of the Paris - South-east (PSE) high-speed line, TGVs will take less than 5 hours between Brussels and Marseilles. 15 December 2002 : Completion of the first part of the Eastern high-speed line. 2003 : Completion of the first part of the high-speed line in Great-Britain for Eurostar. 2005 : Completion of the TGV terminal at Brussels Midi/Zuid station. 2006 : Completion of the second part of the Eastern high-speed lineand the new TGV station in Liège. 2010 : Construction of Brussels' second TGV station, at Schaerbeek, with connections to Brussels airport (subject to confirmation). "Dernière ligne droite pour le chantier du TGV", Eco-Soir, 7 July 2000. Return to the index to the TGV section. This page is maintained by David De Neef. Translation by Alan Reekie. Last revised on 01/23/02 . visitors since 12 August 2000.